A small, oval, English copper saucepan and cover. This piece doesn’t have any manufacturers marks but there are two initials, ‘R B’, engraved on the side and also on the lid. These are only just visible, due to repeated polishing over the years, and they would have been the initials of a previous owner. 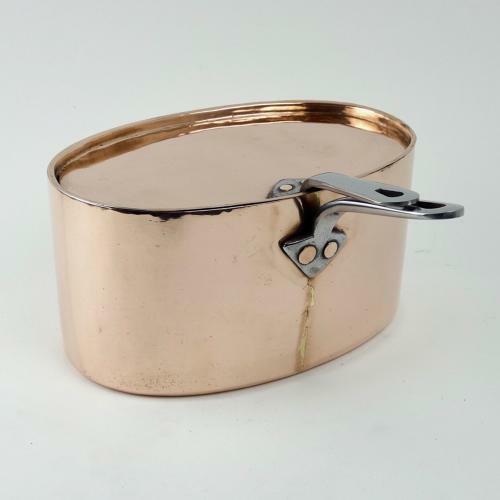 The pan is made from a heavy gauge of copper and it has castellated seams around the base and up one side. The steel handles are a typical English form and the piece dates from c.1860. It is not common to find this shape of saucepan in such a small size. The pan is 23.5cm. long by 15cm. wide by 11.8cm. deep. Overall, including the handles and lid, the piece is 23.5 long by 25.8cm. wide by 14cm. high. It is in excellent condition and the interior has been re-tinned so that it can be used.